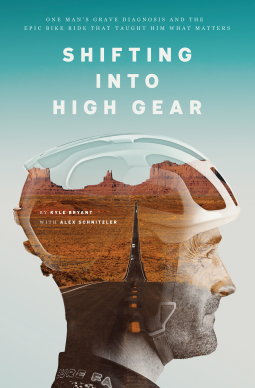 Shifting Into High Gear charts the course of Kyle Bryant's transformation as he journeys on a recumbent tricycle across the United States in the throes of Friedreich's ataxia, a life-shortening and disabling disease. Full of humor and reflection, it's a heroic journey of a man driven to reframe the language of disease through action and service. As you travel with Kyle during two cross-country bike rides through the American West, Texas, the Southern States, and finally to the shores of the Atlantic Ocean, the grueling rides become a compelling backdrop for a series of lessons and ruminations which embrace an alternative worldview and provide practical solutions to everyday problems. A thrilling adventure story, yes, Shifting Into High Gear is also ultimately about helping readers reinterpret the conditions of their lives and learning how positive thinking, purposeful connection, and deliberate actions can help anyone reach beyond their limits and live a bolder and bigger life no matter what the circumstance. Deeply passionate and compassionate, Kyle uses his amazing story to teach readers how to replace the handicapping language of "disability" with the agency to build a thriving and hopeful life. He bravely exposes the shadow-side of using disabling language and asks us to commit to a collective goal of understanding disease and its emotional impact and embrace the disabled population as equal individuals. In telling his story, Kyle's desire is that instead of viewing disease as a deficit, we would see it as another state of being—simply as a life which strikes out on a different path. When Kyle Bryant was seventeen, his world came to a crashing halt when he was told he had a rare disease that would shorten his life by half. Shifting Into High Gear is the thrilling and poignant true story of how he reframed his destiny, going beyond what was possible—and the epic bike ride across America that taught him what mattered about living with courage, conviction, and community. "Striving to be our best possible self while living with medical challenges is something I know a lot about, and when I see that drive reflected in others, like Kyle Bryant, I can't help but cheer them on. Shifting Into High Gear chronicles a true American hero who teaches us that even when the stakes are high or bad days are upon us, those of us given this mixed blessing of pain and purpose simply have no other choice but to keep moving forward. I consider this book a gift for those of us who empathize from our own health challenges as well as anyone interested in making the most of every moment of their lives. Ride on, Kyle!" Shifting into High Gear will be available in advance of Rare Disease Day, February 28, 2019. An early marketing initiative for Shifting Gears will ensure a strong launch! Solid pre-orders, radio promotion, social media outreach, speaking engagements and traditional media appearances, in addition to rideATAXIA events, round out a vibrant promotional campaign. Kyle has made frequent appearances on national and regional shows. He will tap his contacts for support especially during Rare Disease Month: Senior VPs, Producers, Hosts and General Managers and the former head of PR for Warner Brothers who was also the Publicist for The Ataxian! Kyle is a contributor to The Huffington Post and is often featured in print, including: theNew York Times, Boneshaker Magazine, Neurology Now Magazine and USA Triathlon Magazine. His notoriety has led to many online videos with views totaling over 200,000. FARA's email list and Kyle's email list total over 14,500 contacts! Over 100 days of travel annually present exciting opportunities to promote Shifting Into High Gear to consumers and professionals alike. As spokesperson for FARA, Kyle's primary job is outreach; he is often the featured speaker at major events: Children's Hospital of Philadelphia Annual FA Symposium; MDA Canada Youth in Action, the International Ataxia Research Conference UK, Pfizer Pharmaceuticals, UCLA Scientific Symposium, and more. Thank you HCI Publishing and Netgalley for an ARC in return for my honest review. Kyle Bryant has Friedreichs Ataxia, a degenerative neuromuscular disease. Kyles memoir shares his story so far, the triumphs, the pain, the amazing accomplishments while, pushing through this  dis ease and being the best version of himself  he can be. Kyle road a recumbent bike across America to raise funds and awareness for FA. The determination and grit he showed to accomplish this was incredible. This book is the story of this ride. I am very grateful for being given the opportunity to read Kyles book. I learned so much about FA, a disease I had never heard of. I also learned so much about scientific testing, and the constant hopes and pitfalls of families hoping against hope for the next successful trial, drug or positive outcome. The description of the roads literally travelling also interested me, along with the different characters encountere along the way, and of course such an amazing, committed family amd group of friends. A beautiful inspiring story about a rarely disease and how to handle it. I personally suffer from an rare illness that until now has not been diagnosed since appreantly all professionals can only find that I have something but have no idea what it is. So hearing about some that has an actual rare disease  and trying to find ways to promote it and show people that there are quiet a lot of illnesses out there still that are not a joke or imagination just not well known das very nice. On top of that it's a very readable and easy to get throug book and while I personally did not connect to the riding your bike through a country aspect, the ideas behind the entire thing and the stories of the actual rides where nicely done. All Niall a great book which I hope will bring more awareness not only to this specific illness but in general let people know that there is a lot out there  that  is not widely known!